Most business owners we meet don’t enjoy the monotony of bookkeeping, causing their QuickBooks to get all screwed up while they only utilize the invoicing function. Successful businesses have quality accounting & bookkeeping so they can do in-depth tax planning while protecting themselves from errors, audits, and mistakes. If your QuickBooks looks messy, then hire us! We’ll help you focus on your business while serving as your outsourced accountant, bookkeeper, CPA, tax advisor, and payroll specialist. We’ve found that business owners that try to do their own accounting, even with the amazing products like QuickBooks or QuickBooks online, end up with mixed results. 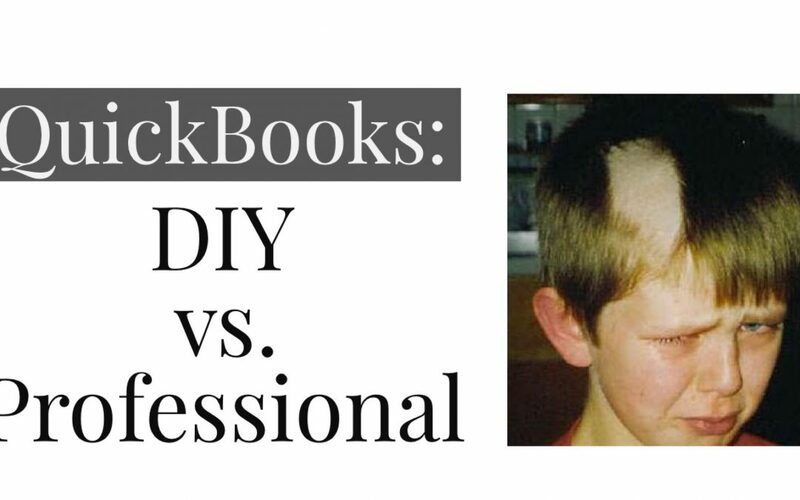 They achieve mixed results because having QuickBooks is a bit like owning electric clippers and scissors, it doesn’t make you a stylist or a barber. Sometimes, doing your own accounting leaves you worse off, kind of like a kid cutting their own hair. Rather than become an accounting expert, we recommend you hire us at Nuance Tax & Accounting, to do your bookkeeping, tax planning, tax filing and payroll for you! On a scale of 1 to 10, how accurate is your bookkeeping in QuickBooks? Do you only use QuickBooks for invoicing, and forget about the rest? Would auditors consider your bookkeeping “audit-proof”? Does your bookkeeping serve as the foundation for year-round, pro-active, tax planning? Does your bookkeeping provide you with helpful, financial management figures? Is filing taxes, reconciling bank statements in QuickBooks, and running payroll, the most efficient use of your time? Should you leverage an expert to allow you to focus on other areas? We’ve found that most business owners do their own Bookkeeping and accounting only because it’s a necessary evil. We’ve also found that most business owners are more passionate about solving customers’ problems, developing strategies, engaging with their employees, making sales, and meeting with prospects; which causes them to avoid taking care of the “tax & accounting monkey” on their shoulder. Business is predicated on getting paid for work, which is why so many business owners only use the invoicing function of QuickBooks and allow the actual general ledger and chart of accounts to get really sloppy. Having a QuickBooks account doesn’t help provide a sound foundation of record keeping, anymore than owning an electric razor provides a stylish hair-do! Nick Meester, Lakeville CPA, is one of the owners of Nuance Financial Tax & Accounting. Nick Meester graduated from Minnesota State Mankato with majors in accounting and finance, which He put to work getting His CPA license and obtaining employment at CBIZ in Minneapolis Minnesota. He spent a number of years helping clients within this elite firm, before leaving to serve as the lead accountant at Eagle Brook Church in Lino Lakes Minnesota. Eagle Brook is one of the 20 largest churches in America, and Nick really enjoyed the leadership development and competency that He developed there. Eagle Brook Church and CBIZ prepared Nick to start Nuance Financial Tax & Accounting. Here at Nuance Tax & Accounting, we’ve developed a unique business model that combines bookkeeping, accounting, tax preparation, tax planning, payroll, and consulting, all together. The idea behind Nuance Tax & Accounting is to empower small businesses to focus on what they do best, by serving as their outsourced accountants, tax advisors, bookkeepers and payroll specialists. We serve as an outsourced accountant for small businesses so they can have a robust finance department, for a reasonable monthly fee, rather than having to hire their own accountant or bookkeeper. We talk with dozens of small business owners a week, and we often find that small business owners neglect their actual bookkeeping because it’s not urgent and it’s a waste of their time. Their QuickBooks become inaccurate, which means that they’re unable to do pro-active tax planning throughout the year. Without a foundation of solid books, they can’t understand how their business is trending, and sometimes they become the prey of an IRS or state auditor. Small Businesses deserve to pay as little in taxes as possible, and each successful business owner should be working with an informed expert to ensure they pay their fair share, and not a penny more. Tax planning is important for a business owner in the year that they are operating, but they also need to have macro-level tax planning which provides life-long strategies to mitigate their tax burden. Providing macro-level tax planning means that we are often consulting and guiding business owners on business acquisition, retirement plans, and we also spend a tremendous amount of time advising on real-estate investment. The government subsidizes agriculture, jobs, housing, and investments; which means these areas each have opportunities to provide tax efficiency. Business owners often have multiple companies with various types of income, each one is a piece of the tax-planning puzzle. If you like the idea of having a firm take care of all the accounting, bookkeeping, tax filing, tax planning, payroll, sales tax, and other financial operations, then give us a call. We assure you that having a one stop shop is helpful, convenient, and results in “good looking” accounting! Check out our google reviews to see what our clients have to say about us.